We’d love your help. 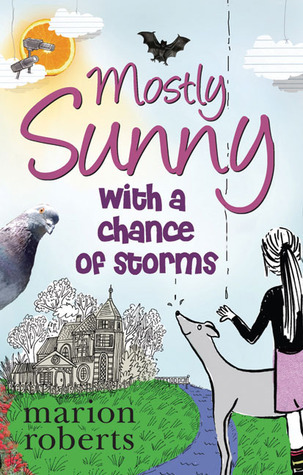 Let us know what’s wrong with this preview of Mostly Sunny with a Chance of Storms by Marion Roberts. Sunny Hathaway—introvert, entrepreneur, inventor, poet, dog lover, and lateral thinker—has a lot on her plate. She's moving to a new house, dealing with step-siblings, and starting a dog entertainment business too. Sunny and her expertly blended, thoroughly modern family are moving into her grandmother's old mansion, Windermere. Sunny wins the turret bedroom from her step- Sunny Hathaway—introvert, entrepreneur, inventor, poet, dog lover, and lateral thinker—has a lot on her plate. She's moving to a new house, dealing with step-siblings, and starting a dog entertainment business too. To ask other readers questions about Mostly Sunny with a Chance of Storms, please sign up. Even though this is a book targetted for the youth, i still liked the story and the cosy atmosphere, that brings back many childhood memories. Sunny is not happy about moving to the mansion left by Granny Carmelene to Sunny’s mother, Alex. As she points out she ‘isn’t so good with change’. What an understatement, but as in the previous tale of Sunny, Sunny Side Up, change, adaptation and cooperation just make life better, brighter, and richer—eventually! Establishing a civil relationship with Carmelene’s old gardener, Settimio, seems doomed to failure, but even that has an unexpected outcome. As well there is a new mini-business (dog exercise and training) set up by Sunny and her two step-siblings Lyall and Saskia, Sunny finds a new friend training pigeons for pigeon post, the grounds of the mansion are set aside for community gardens, step-mother Steph and baby Flora move in and there is a wedding. A happy, ever-interesting story with a touch of sadness in Sunny’s imaginative method for dealing with grief, and much hilarity, especially Saskia’s determination to be dyslexic, just like famous artists of the past. Community life. Cooperation. Depression, Mental. Girls. Grief. Houses. Imagination. Melbourne, Vic. Moving house. Relationships. Step-parents and stepchildren. I first read it when I was about 11. Since then I have read it over 20 times and I still laugh out loud every time. If I finish a depressing book that didn't have a happy ending (which unfortunately is happening a lot lately) I always open to a random page and read this book. It just cheers me up so much. I read "Mostly Sunny With a Chance of Storms" before "Sunny Side Up" and this didn't really matter or spoil anything. I went out and bought "Sunny Side Up" as soon as I had I loved this book!! I read "Mostly Sunny With a Chance of Storms" before "Sunny Side Up" and this didn't really matter or spoil anything. I went out and bought "Sunny Side Up" as soon as I had finished this. This book gave me real estate rage, but apart from the foaming with jealousy part, I was charmed by Sunny. I read the first a few years ago, and picked this one up looking for a good tween novel. Enjoyed the characters immensely, I would have liked more Finn. Marion Roberts always wanted to be a fashion designer, but she studied science, alternative medicine, psychotherapy, and psychology instead. She also worked as a chef and taught people how to cook. Marion started writing because she wanted a job she could do in her pajamas. Also, her friends kept saying her emails were too long, and she needed to find another place to put her stories. She was born Marion Roberts always wanted to be a fashion designer, but she studied science, alternative medicine, psychotherapy, and psychology instead. She also worked as a chef and taught people how to cook.